The winter season is upon us; the weather is getting colder, and people are counting the days until they get a little time off from work or school. Why not warm yourself by the kindling Chanukah lights? Local Jewish groups are getting ready to roll out the red carpet for this well-known religious holiday, which will take place this year from sundown Dec. 6 to sundown Dec. 14. Check these out! Feel free to add more in the comments, and chag sameach. For members Of A Certain Age (50+) to discuss texts and stories about women in Chanukah and other times of liberation. For GLOE and related LGBTQ groups, a 21+ Chanukah brunch with mimosas. Rabbi Shira leads discussion on Chanukah, with latkes and sufganiyot. Annual young adult shindig sponsored by several Jewish organizations. Collection boxes for donations to homeless community charity, D25 at the DCJCC. Featuring board games and donations. Not Your Bubbe’s Sisterhood event featuring essential oils, history and benefits for modern day living. Jewish-inspired yoga near the Chanukah lights. 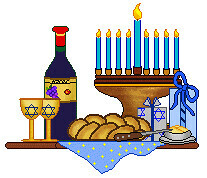 Can bring your own menorah. Musical Shabbat services followed by dinner and carnival amusements, including face painting, balloon animals and games. Family Chanukah party, featuring a moon bounce, games, crafts, treats and more!